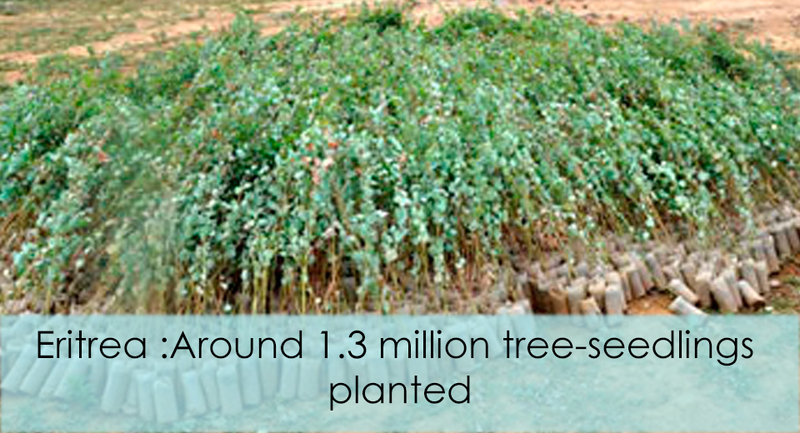 Around 1.3 million tree-seedlings have been planted in the Southern region this year alone, according to Mr. Ghebremichael Berhe Head of Wildlife and Forestry Authority in the region. In an interview he conducted with ERINA, Mr. Ghebremichael explained that 27 different types of tree-seedlings have been distributed and have been planted through popular campaigns involving individuals, students, as well as government and non-government institutions. Pointing out that that Students’ Summer Work Program is one of the major national development programs to ensure sustainable soil and water conservation throughout the country, Mr. Ghebremichael stated that around 5,000 students along with their supervisors have conducted successful popular summer campaigns this year. Mr. Ghebremichael urged residents of the Southern region to reinforce soil and water conservation programs thus contributing due role in the effort to ensure food security.